Markhamia zanzibarica, a small, tropical tree with striking flowers and decorative fruits, is Tree of the Year for 2008, together with Diospyros whyteana and Harpephyllum caffrum. Markhamia zanzibarica is a small, upright tree with slender, crooked branches and a soft green crown. It grows about 3.5 m tall but can reach up to 7 or 8 m. Its bark is grey-brown, smooth and glossy when young and flaky in older trees. The young branches have conspicuous lenticels (raised pores on the surface of the bark). The leaves are opposite, compound and imparipinnate, which means it has leaflets on either side of the stalk and ends in a terminal leaflet. It has 2-4 pairs of leaflets, the lowermost pair is the smallest and each pair increases in size towards the terminal leaflet. There may be fine yellowish hairs on both surfaces of the leaf, but the upper surface will lose these hairs by maturity. The leaf margins are entire or finely toothed. 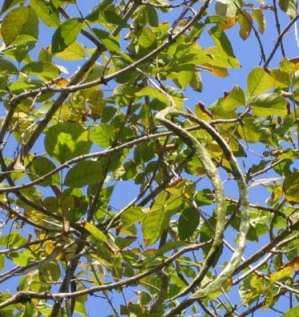 The petiolules are almost absent and the petiole is 40-90 mm long. 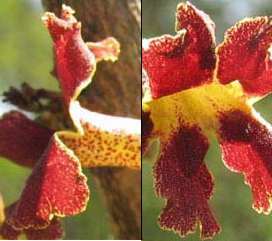 The striking flowers are yellow with maroon flecks, bell-shaped, 2-3 mm long, with spreading lobes. They appear on the old wood, in racemes, during spring to summer (from September to January). The fruits are slender, bean-like capsules, 300-500 mm long and spirally twisted, and dangle from the tree in late summer (January to May). Dark brown when mature, they split open lengthwise to release many flat, winged seeds. Markhamia zanzibarica is not threatened. This is a tropical tree occurring at medium to low altitude from Tanzania and Malawi, south to the Kruger National Park in South Africa, and westward to Botswana, Namibia and the Caprivi Strip. It is found in bushveld, in riverine fringes, and often on rocky ridges and on hill slopes. It is commonly found growing among rocks on the dry northern slopes of the Soutpansberg. The genus Markhamia was named by Berthold Seeman, in honour of his friend Sir Clements Robert Markham (1830-1916), English geographer and traveller, who introduced the famous quinine-yielding cinchona into India. The specific epithet zanzibarica is given for Zanzibar, the island lying 36 km off the Tanzanian coast in the Indian Ocean. Markhamia belongs in the Bignoniaceae, a large family full of popular garden trees, shrubs and creepers. Garden plants in this family that are very well known to South African gardeners are jacaranda trees and trumpet creepers. Some southern African indigenous plants in this family are Kigelia africana (sausage tree), Tecoma capensis (Cape honeysuckle), Podranea ricasoliana (Port St Johns creeper) and Rhigozum obovatum. Markhamia has 10 species that occur mainly in tropical Africa. There are two species found in southern Africa, M. zanzibarica and M. obtusifolia. The flowers are visited by ants. The papery, winged seeds are dispersed by wind. The leaves are eaten by elephants. The wood is fairly hard and durable, pale brown to yellowish, finely grained and produces a smooth finish. It is used in buildings for roof timbers and to make tool handles. It is well suited for the manufacture of ornaments. Branches are usually too small to be of value. The roots are used in traditional medicine to treat backache. Markhamia zanzibarica is sensitive to severe frost and cold and does best in bushveld (savanna) gardens. Grow it in a warm, sunny spot in well-drained, fertile soil, and give it ample water during the summer. It is relatively slow growing and its small size makes it suitable for small gardens and courtyards. 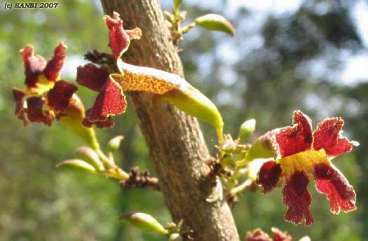 Markhamia zanzibarica is easily propagated from seed and truncheons. Sow seeds in spring or summer in a sandy mixture. Cover the seeds lightly with sand and keep moist and warm. Seeds will take three weeks to germinate. Seedlings should be transplanted into pots or bags when they are large enough to handle. Take truncheon cuttings in late winter. Cut a medium-sized branch from the mother plant and plant directly into the soil or a pot/bag. I gratefully acknowledge the help received from Ernst Van Jaarsveld for notes on how to grow this tree, and Alice Notten for helping with the writing of this article. Coates Palgrave, K. 1992. Trees of southern Africa, edn 2?. Struik, Cape Town. Leistner, O.A. 2000. Seed plants of southern Africa : families and genera. Strelitzia 10 National Botanical Institute, Pretoria. Ross, J.H. 1976. Markhamia obtusifolia. The Flowering Plants of Africa 44: t. 1757. Schmidt, E., Lotter, M. & McCleland, W. 2002. Trees and shrubs of Mpumalanga and Kruger National Park. Jacana, Johannesburg. Van Wyk, P.1984. Field guide to trees of the Kruger National Park. Struik, Cape Town.